A web site dedicated to one of the members of 358 Co L - developed by his son, Dan Sheridan. Others are profiles as well. 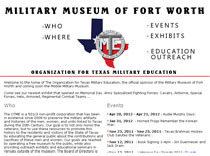 The Organization for Texas Military Education has its museum in Fort Worth, Texas. The museum has an unparalleled 90th Division collection, not just showcasing their uniforms and equipment, but rather the men and their stories as a more complete presentation. The site honoring the 90th in Periers France - a lot of information and history of the 90th activities is located here. A good source for those who want to know about the 90th in France. Includes much on modern history concerning recent dedications, monuments and honors to the 90th. A group of American Historians and Collectors who are also Reenactors. With an obsessive focus on research and eye for detail, the focus of this group is to accurately represent and retell the story of the 90th. A group of French Historians and Collectors dedicated to researching their history and how the 90th fits into it - and commemorating that history through marches, photographs and film. This forum is in French. World War II Washington Memorial Site The story of the memorial and its construction status, due to be dedicated in 2004. Look at the this page and you see WWII Registry. This will take you to the site where veterans and their families can register their names in the Registry of Remembrances and Honor those that served us so well. A donation is not necessary. Go here to register and honor your Tough Ombre. www.memorial-montormel.org It is the website of the battle of Falaise museum, in France. Today we have finished French version, and an English version is under way. Rutgers Oral History Archives - 238 oral histories of WWII - very interesting reading. Veterans History Project - a Project of the American Folk Life Center of the Library of Congress The Veterans History Project covers World War I, World War II, and the Korean, Vietnam, and Persian Gulf wars. It includes all participants in those wars--men and women, civilian and military. It documents the contributions of civilian volunteers, support staff, and war industry workers as well as the experiences of military personnel from all ranks and all branches of service--the Air Force, Army, Marine Corps, and Navy, as well as the U.S. Coast Guard and Merchant Marine. The service history of hundreds of veterans are listed here under the National Registry of Service section. Lots to read and hear at this site and maybe you can participate in a worthwhile project. TankBooks.com - A very informative site of photos, interviews, and stories about WWII. Tanks for the Memories and They were all Young Kids are from this site. See your Past Association's president's story listed under interviews. Link courtesy of Aaron Elson. This is a commercial site. Audio Murphy - A collection of on line recordings of interviews with WWII veterans by Aaron Elson. This is a commercial site.